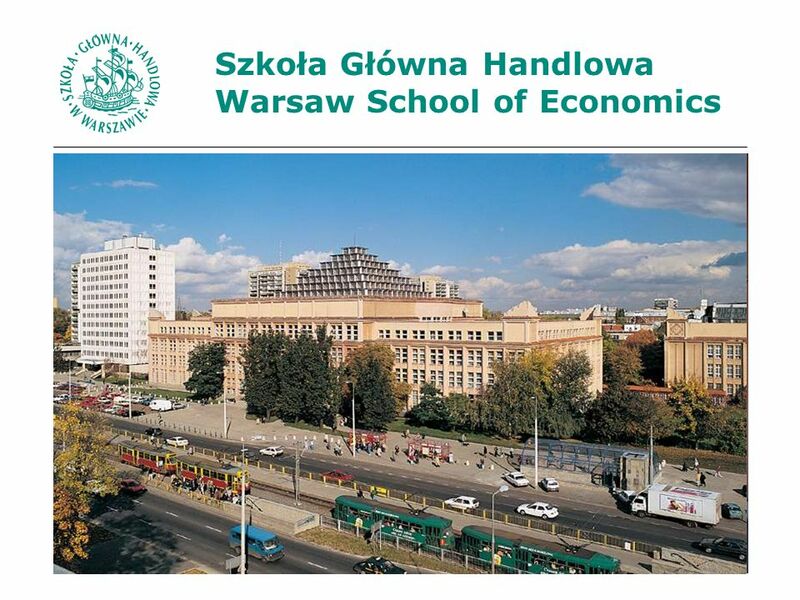 Szkoła Główna Handlowa Warsaw School of Economics. 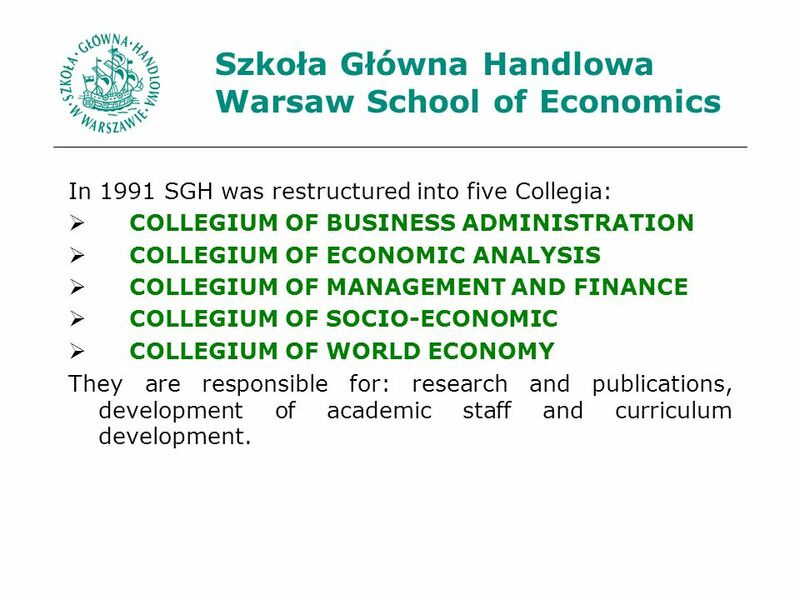 5 Szkoła Główna Handlowa Warsaw School of Economics In 1991 SGH was restructured into five Collegia: COLLEGIUM OF BUSINESS ADMINISTRATION COLLEGIUM OF ECONOMIC ANALYSIS COLLEGIUM OF MANAGEMENT AND FINANCE COLLEGIUM OF SOCIO-ECONOMIC COLLEGIUM OF WORLD ECONOMY They are responsible for: research and publications, development of academic staff and curriculum development. 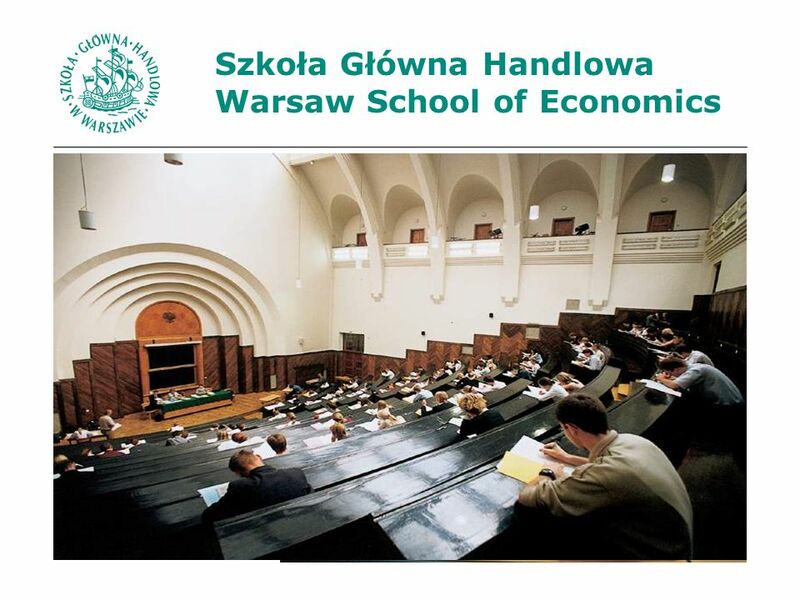 6 Szkoła Główna Handlowa Warsaw School of Economics SGH COLLEGIA In a sense, these are the equivalent of a Western faculty or school, though they lack some of the managing powers over programmes, student and academic administration, which are traditionally associated with faculties in a Western setting. 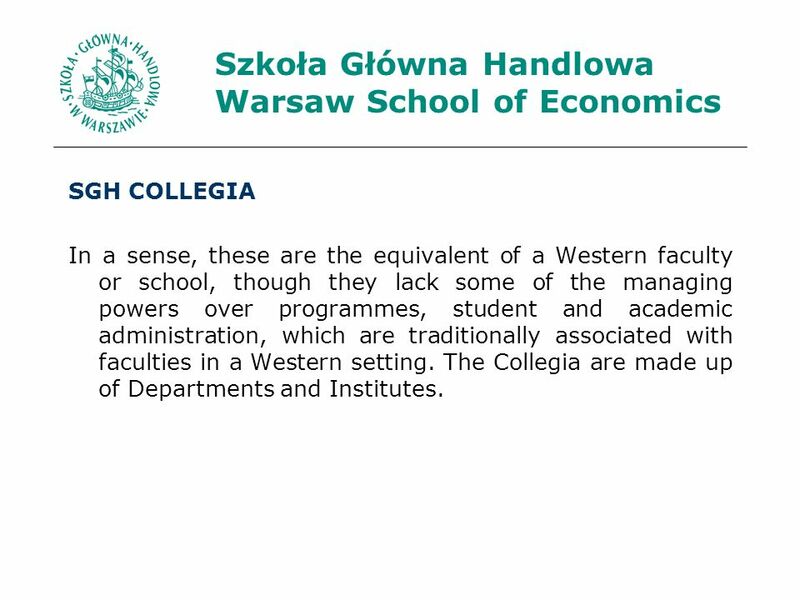 The Collegia are made up of Departments and Institutes. 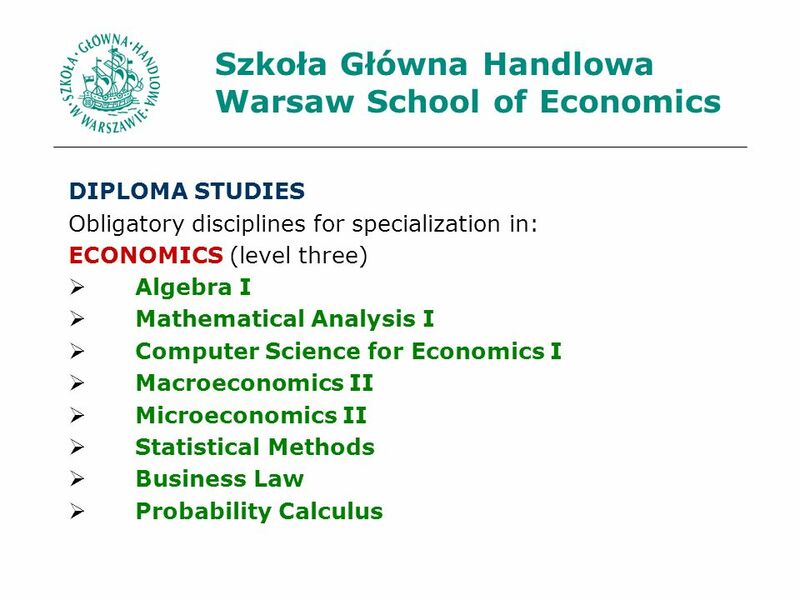 8 Szkoła Główna Handlowa Warsaw School of Economics DIPLOMAS Warsaw School of Economics awards two kinds of diplomas for full-time and extramural students: The LICENCJAT Diploma (an equivalent of the B.Sc. 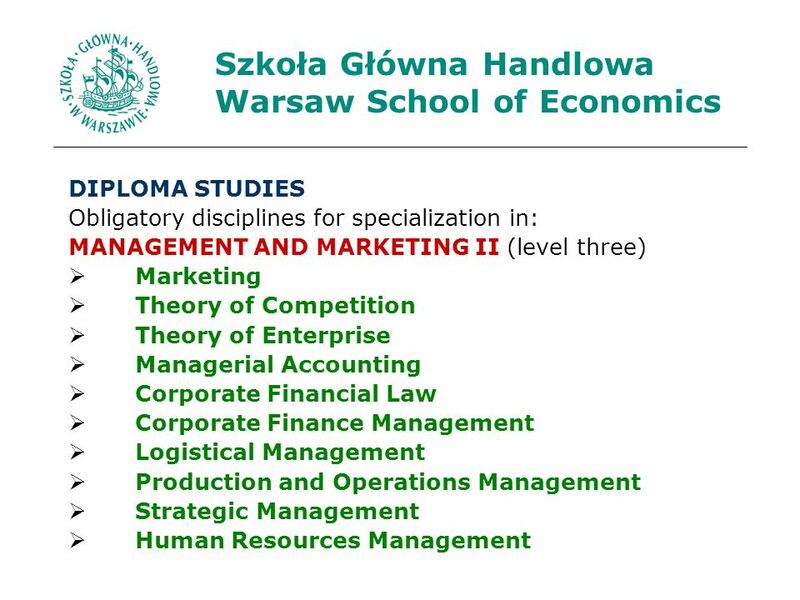 Diploma) The MAGISTER Diploma (an equivalent of the M.Sc. 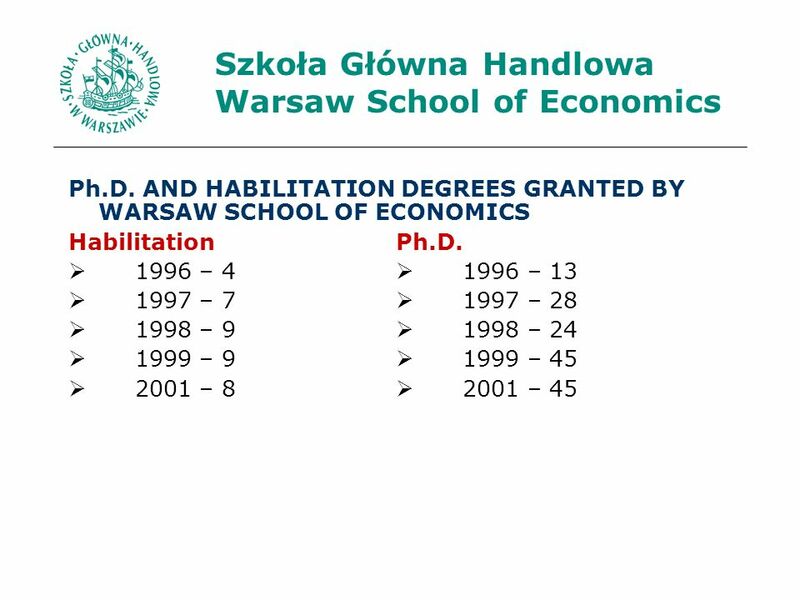 Diploma) The Ph.D. 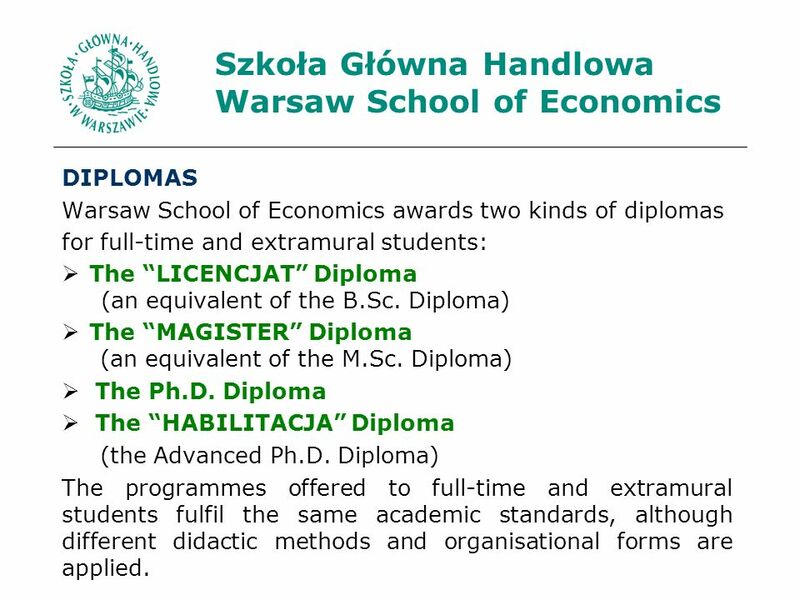 Diploma The HABILITACJA Diploma (the Advanced Ph.D. 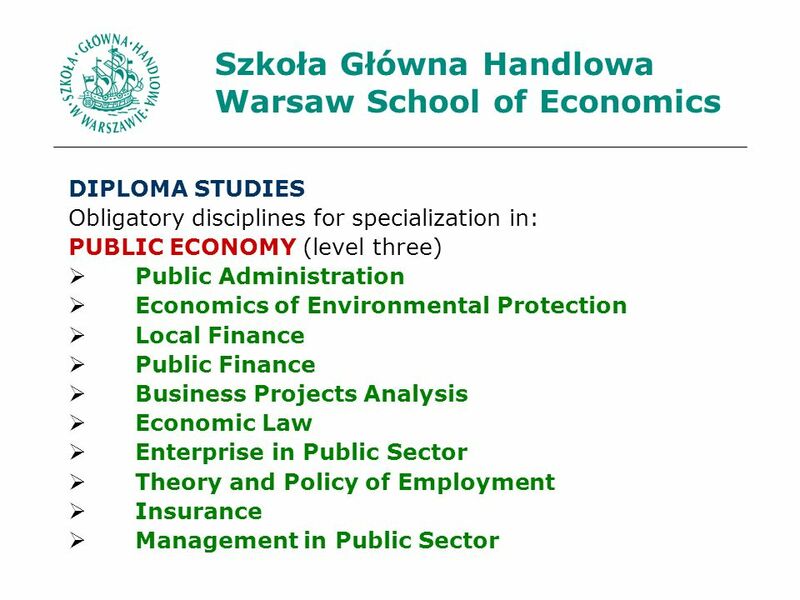 Diploma) The programmes offered to full-time and extramural students fulfil the same academic standards, although different didactic methods and organisational forms are applied. 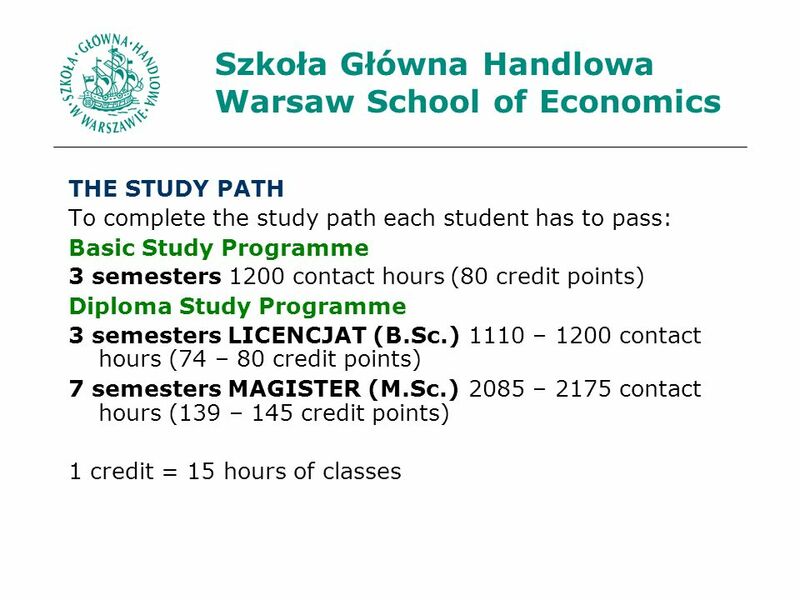 10 Szkoła Główna Handlowa Warsaw School of Economics THE STUDY PATH The individual choice made by the student enables them to create his/her own path of study. 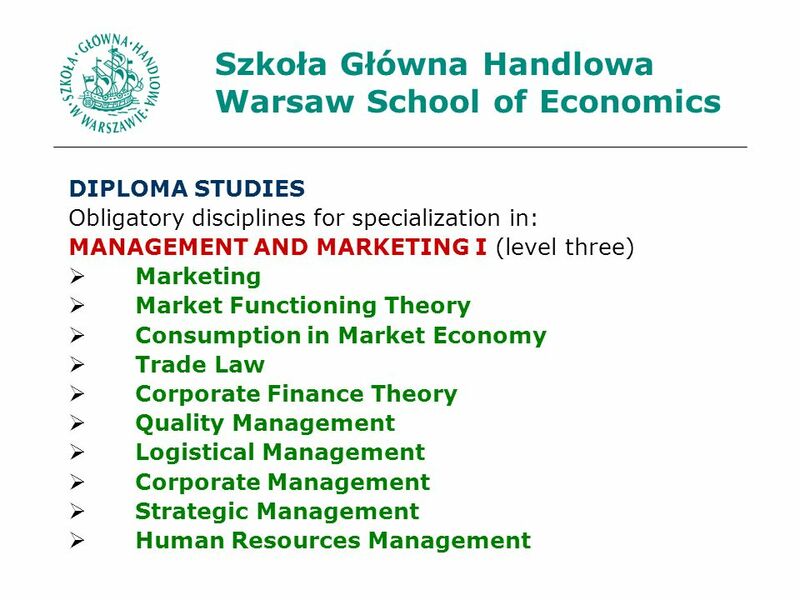 The curriculum allows students to obtain more than one diploma, provided that they can meet the requirements of each field. 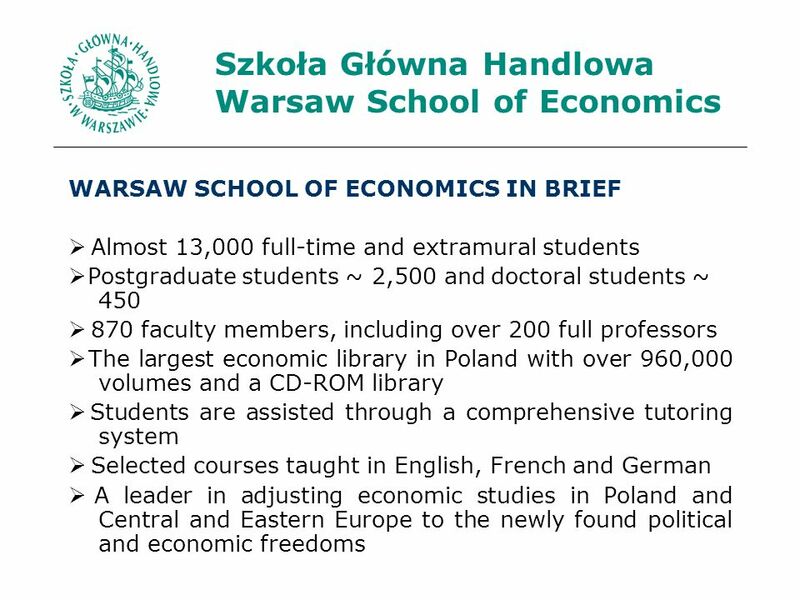 Moreover the students may study in a foreign language, both at the Warsaw School of Economics and within exchange programmes. 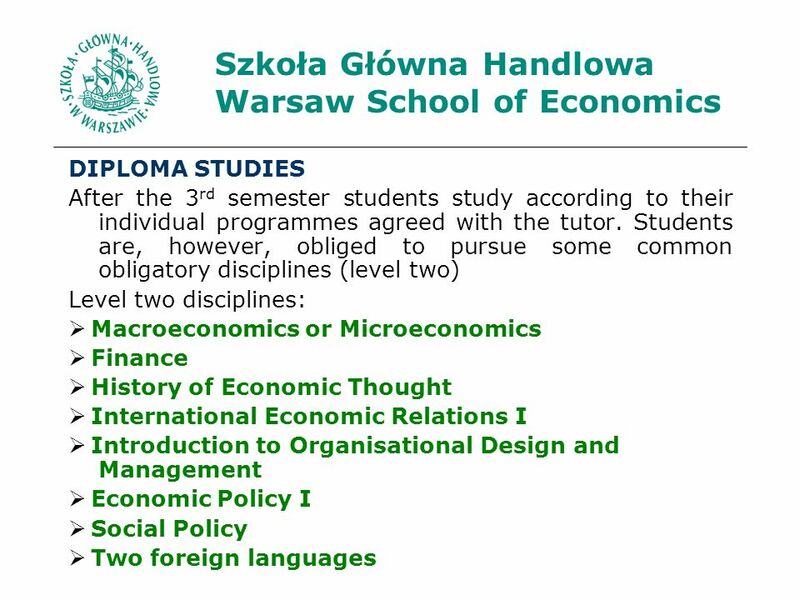 13 Szkoła Główna Handlowa Warsaw School of Economics DIPLOMA STUDIES To graduate the students must meet the curriculum requirements of their specialization (level three). 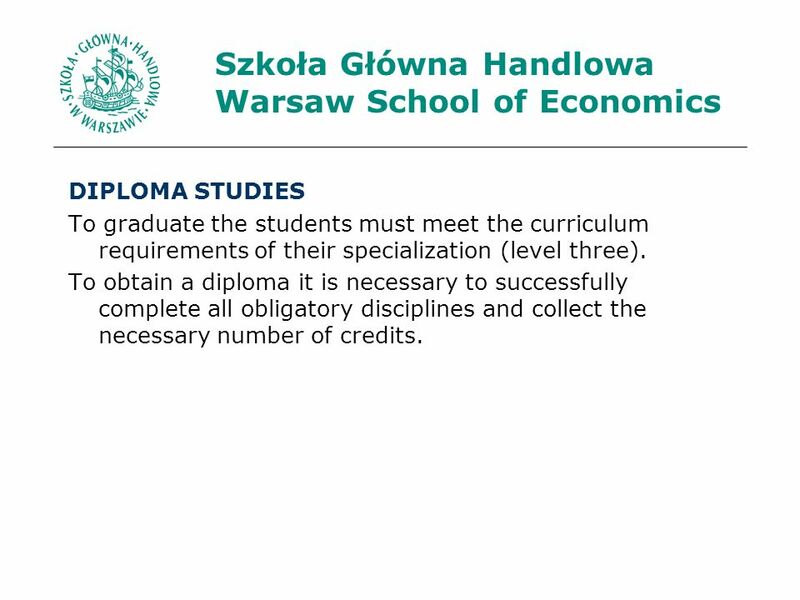 To obtain a diploma it is necessary to successfully complete all obligatory disciplines and collect the necessary number of credits. 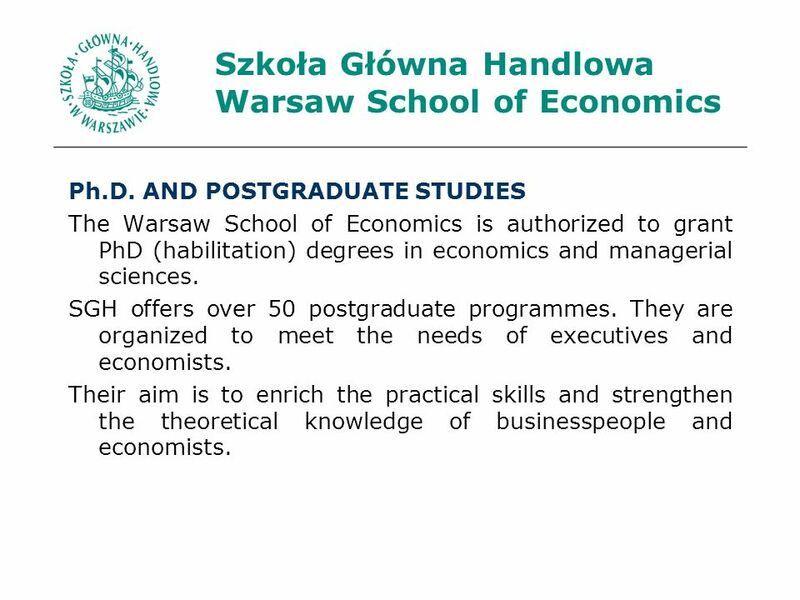 24 Szkoła Główna Handlowa Warsaw School of Economics Ph.D. AND POSTGRADUATE STUDIES The Warsaw School of Economics is authorized to grant PhD (habilitation) degrees in economics and managerial sciences. SGH offers over 50 postgraduate programmes. They are organized to meet the needs of executives and economists. 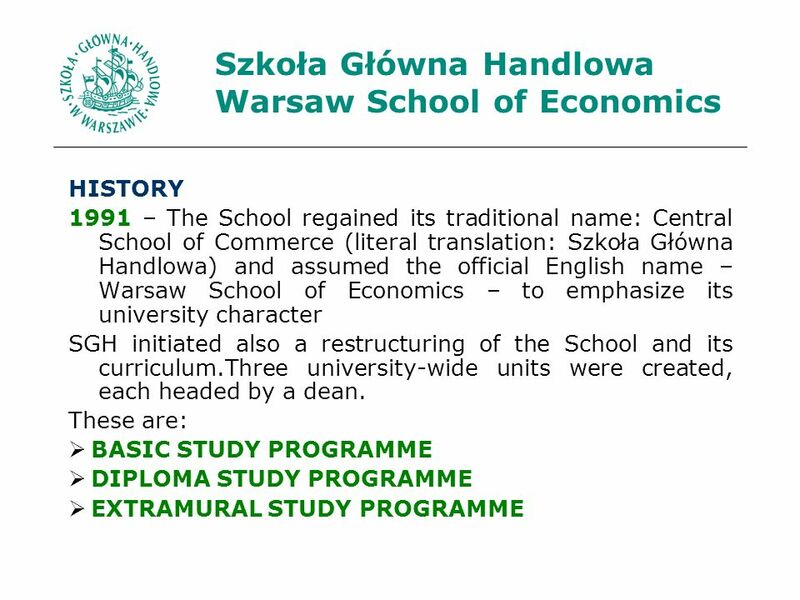 Their aim is to enrich the practical skills and strengthen the theoretical knowledge of businesspeople and economists. 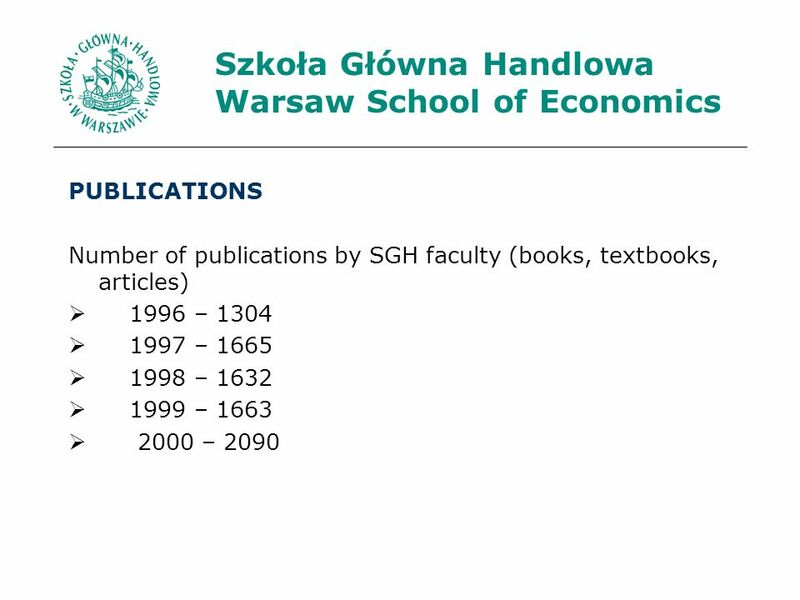 27 Szkoła Główna Handlowa Warsaw School of Economics INTERNATIONAL COOPERATON SGH maintains extensive foreign contacts with over 100 universities. 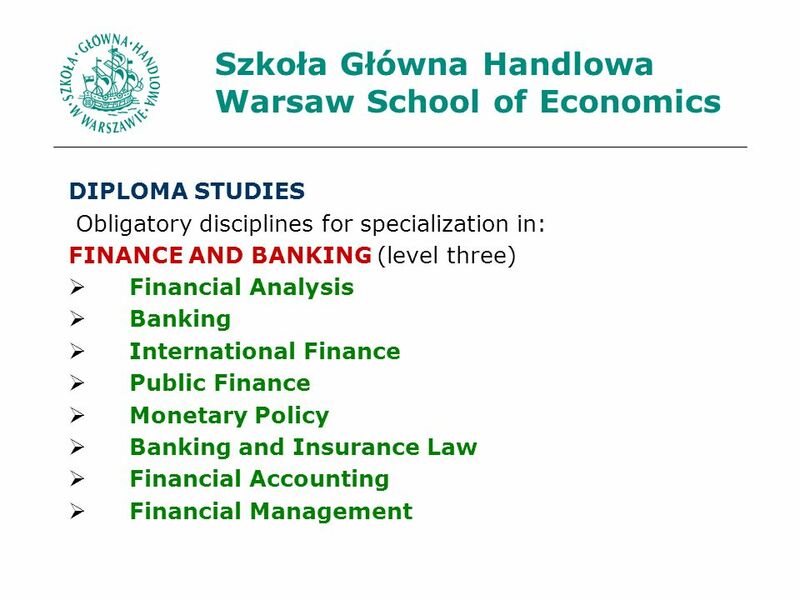 As a result the students have the opportunity to undertake studies in foreign languages and to obtain knowledge in specializations that are not well developed in Poland. 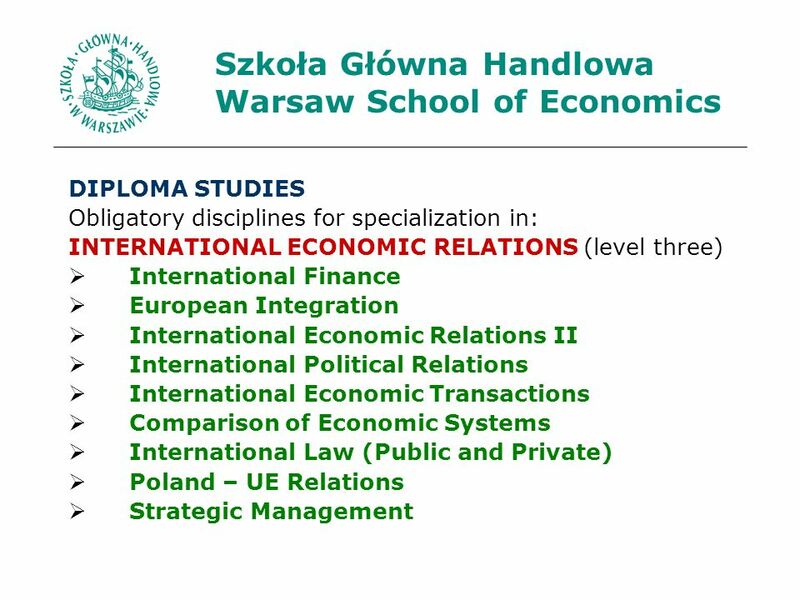 These contacts serve to expose students and faculty to the rapidly changing global economy. 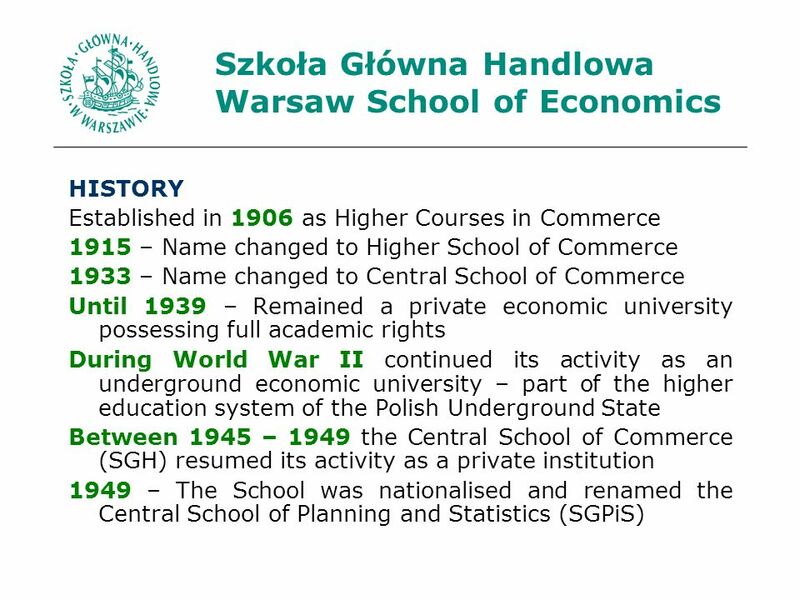 Download ppt "Szkoła Główna Handlowa Warsaw School of Economics." Life Impact | The University of Adelaide Building Your Degree - Pathways Bachelor of Commerce Accounting Corporate Finance International Business Management. 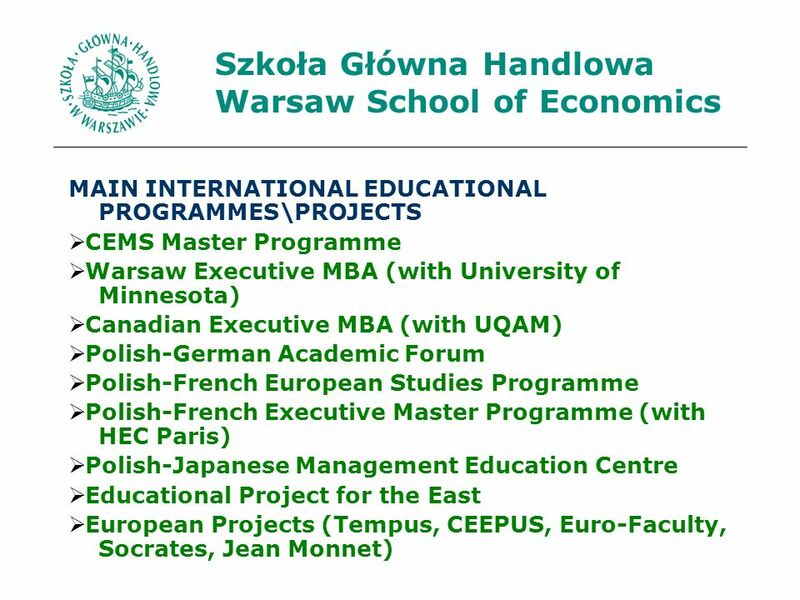 Alliance Program Columbia University Paris Pantheon Sorbonne University – Ecole Polytechnique – Sciences Po. Faculty of Mechanical Engineering, University of Niš ENGINEERING EDUCATION at the Faculty of Mechanical Engineering, University of Niš 1. Welcome to the University of Strathclyde Business School leading business education, research and consultancy. Universita’ Commerciale Luigi Bocconi In the words of its first Rector and President, Leopoldo Sabbatini, Bocconi's mission is to "promote harmony between. Give a man a fish and you feed him one day. Teach a man to fish and you feed him for a long time. Chinese proverb. School of Business University of Bridgeport Admissions Presentation Robert Gilmore, Ph.D. Associate Dean School of Business. NTUST National Taiwan University of Science and Technology 2009 School of Management. 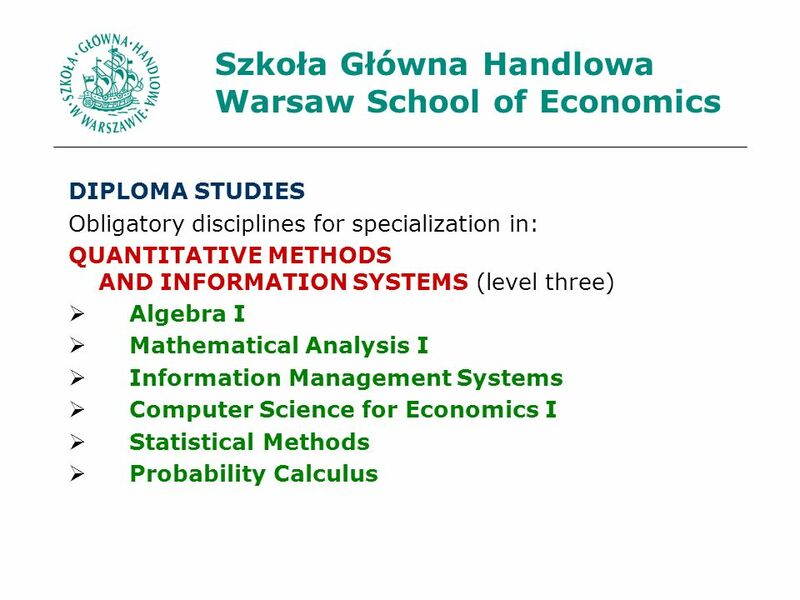 Teaching (Official) Statistics: Faculty of Informatics and Statistics University of Economic, Prague. 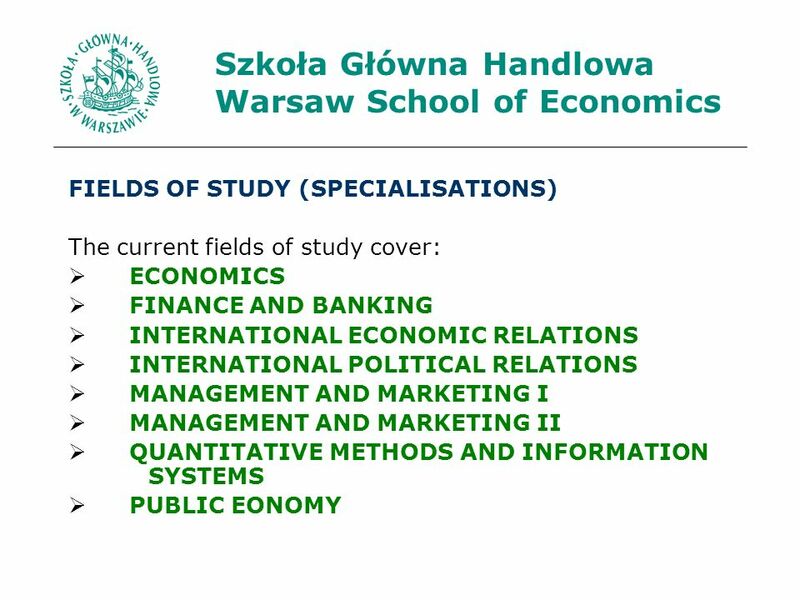 Master in Economics & Finance Institute of Economic Studies Charles University, Prague. 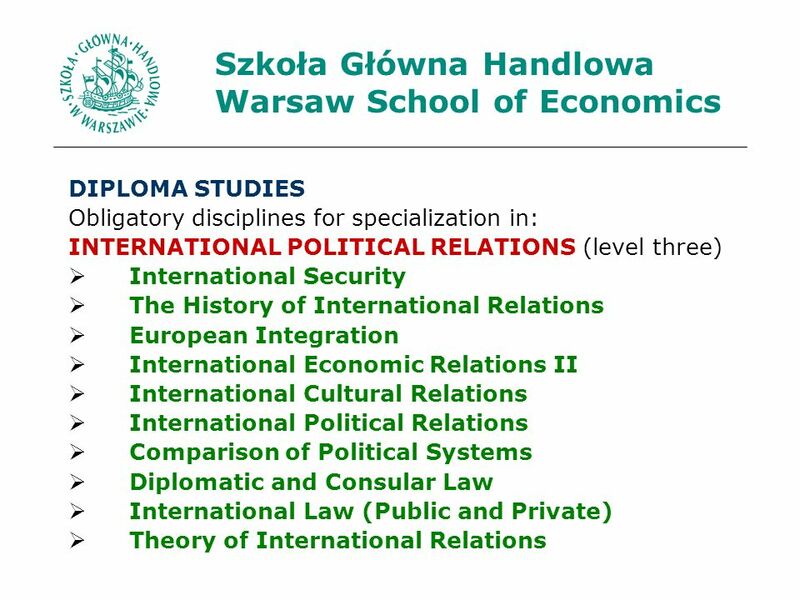 Duration of study: 4 academic years (8 semesters) ECTS credits: 240 Enrollment quota: 60 (for Croatian and foreign applicants) Academic title: Bachelor. Thinking of a Master´s?. MAIN FEATURES OF THE PROGRAM WHAT IS IT ABOUT? 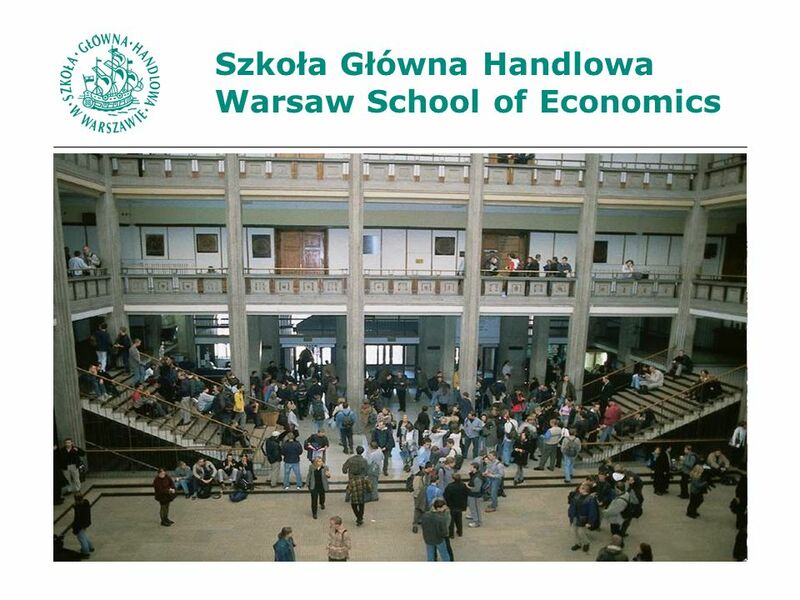 It provides a sound understanding of economics and its applications. Students. 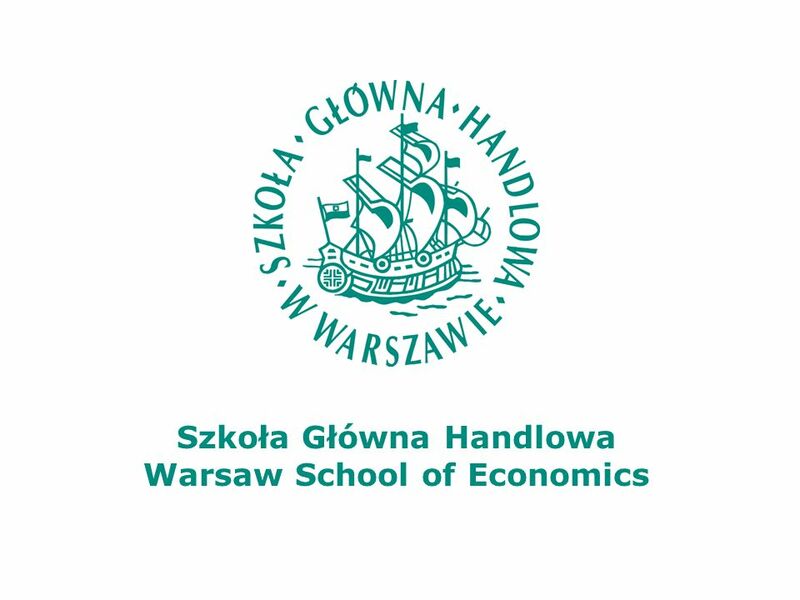 SZKOŁA GŁÓWNA HANDLOWA W WARSZAWIE WARSAW SCHOOL OF ECONOMICS 2009. The School of Public and Environmental Affairs and Some Reflections on Public Affairs Education and Research National Sun Yat-Sen University Monday March.